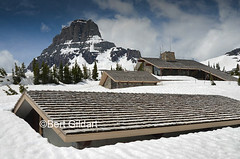 ©Bert Gildart: As I approached Montana’s Logan Pass this past Saturday, June 1, I was surprised when another cyclist — peddling back down from the summit — suddenly asked my age. “I’m 74,” he laughed. The he began committing on our magnificent surroundings, reflecting on our luck for still being part of it. Though I never did provide a precise response regarding age, I did remark that, yes, we were lucky we could still bike to this 6,680 foot high pass. It not an easy ride, but it is the only way to reach this pass in early June, for although the road is plowed to the summit, it is not yet open to vehicular traffic, and from the pictures included here, you’d be correct in concluding that it won’t be open for yet a few more weeks. You’d also be correct in assuming that for me, at any rate, seeing this spectacular pass before the hordes of humanity mar the uncluttered winter snows was worth every ounce of energy that I expended. So it must have been for my new friend. 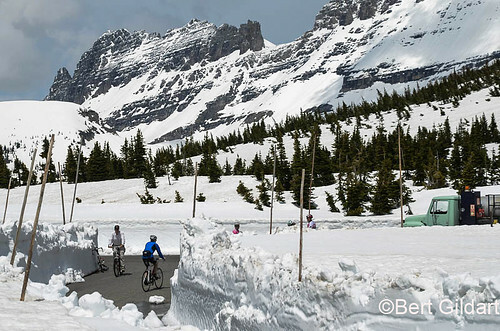 Lone biker dwarfed on June 1, 2013 by vast amounts of snow. In short this is good news for cyclist. It means that on the weekends you can enjoy this magical part of the world without having to contend with vehicular traffic. During the week snow plows are clearing the road of snow and rocks – and even a few trees that have careened downhill, uprooted by the power of an avalanche. Maintenance crews are now preparing the road for the two million summer visitors that will soon start driving this same road, once it is safe and when visitors can access the restrooms, something they can’t do now (see below). To bike this segment you must park your car at the Avalanche Lake Parking lot, mount your bike and then peddle along this 16 mile-long section of the Going to the Sun Road that climbs almost 4,000 feet. Saturday, lots did it and though cyclists were mostly “young kids” in their 30s and 40s, a few were more mature. but toilets (building in foreground) not yet open. Visitor Center shown in rear. What I’m saying with these thoughts is that Logan Pass (The Polga family — and grandchildren — will remember this great goat outing) seems to represent a challenge on whatever level you strike out, and perhaps that’s because we know it is a challenge just to open the pass. 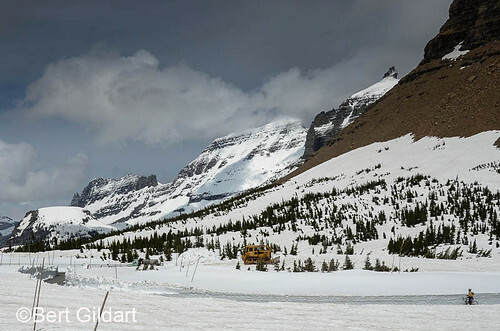 Road crews work closely with avalanche specialists who monitor the 34 avalanche paths along the road below Logan Pass. To assist with safety the park hires an avalanche technician who usually hikes above the road to watch snow conditions and warn the crew below if an avalanche is imminent. Tragically, two people died in 1958 when an avalanche hit the plows they were operating. Narrow path courses through deep snow at Logan Pass with riders leaving and arriving. It is these very conditions that factor into the opening and closing dates, which usually occurs about the 2nd week of June and then remains open through October. It is these very difficulties that have also created one of the nation’s most exciting (and yes, challenging) all-day bike rides. Along the way I saw a black bear and some of the world’s most incredible scenery. I also remember — and vividly so — that as I approached the top my thighs were really starting to burn! Because I am a “mature” rider I took about four hours riding to the top. At the summit I then poked around on the pass taking pictures for about an hour. Riding back was, of course, a piece of cake though again I dawdled, simply enjoying the beauty of June 1, 2013 in Glacier National Park. It is something we’ll be able to do for yet a few more weeks before the park officially opens, and if my “new friend” and I can do it, then most anyone can. Believe me, it is worth the scorching sensation in leg muscles, for there is also a real sense of accomplishment that only comes when you have experienced something that is grand. *Protecting Our New Airstream — Are We Going to Extremes? 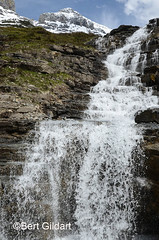 This entry was posted on Sunday, June 2nd, 2013 at 4:53 pm and is filed under Biking, Glacier National Park, Natural History/Conservation, Photography, Travel. You can follow any responses to this entry through the RSS 2.0 feed. You can leave a response, or trackback from your own site.